There is a saying in Costa Rica that reads, “Lunes ni las gallinas ponen”, which means On Mondays, not even the hens are laying. We certainly can relate to Mondays in that way. With all of the activities and projects, it sometimes seems like we need another weekend in order to rest from our weekend. 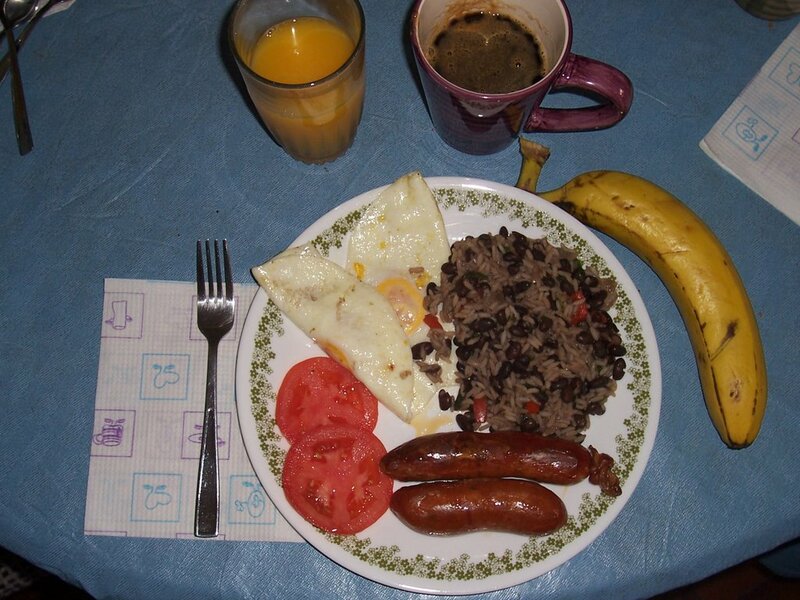 For this reason, it is important to start off with a good breakfast to get our energy going, and on days like today, Costa Rica’s national holiday of Labor Day, we have the time to prepare it. Of course, no breakfast is complete without a good cup of coffee, but how to prepare it? Prepare it Costa Rican style, caf� chorreado. First, you need a chorreador, the coffe maker pictured in this post, which essentially is a cloth bag suspended by one of a various arry of wooden frames. I picked up what I thought was a fairly attractive one for about $12. The coffee, ground fairly fine, is placed in the wet bag at the desired strength. (I prefer 2 tbls. per 6 oz. of water.) Then, water, just off of the boil, is poured over the grounds slowly, so as to create a stream, or “chorro” from the bag into the cup. The result is a fine brew that allows the natural oils of the coffee to pass through to the cup. 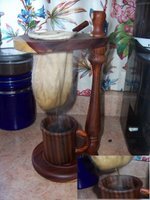 And although many Ticos have switched to the “coffee maker” because of convenience, the choreador is still the most repected way to make coffee. So there you have it, a good Monday morning pic me up. Sorry that this came on Tuesday for those of you who are subscribing via email. Very cool. How hard is it to clean? The choreador is about as easy as it gets to clean. Just flip the bag inside out to knock out the grounds, scrub the filter to clean out the residue, and hang it in the frame to dry. Yeah, yeah . . . I see all of the coffee posts, but what about the great Costa Rican tea? You must be bias! You’re right. I am biased. I’m a coffee lover, but coffee is basically what built this society. In fact, it was a tax on coffee that built the National Theater, the “jewel” of Costa Rican culture. So, I’m just mixing in with the coffee biased culture of this country. Still, let me know what to look for and I’ll write a post about it.